Emily Smith-Dungy has the determination, the competitive streak, and loads of jump-roping trophies on her shelf; but one thing Emily Smith-Dungy (played by actress Olesya Rulin) doesn’t have is the support from her family at her big jump-roping state championship. With the lack of her family’s attendance at her significant competition, it’s as though that was the straw that broke the camel’s back; and Emily Smith-Dungy decides there is only one hope in reuniting her family- taking them hostage and re-educating them to bring them closer together. 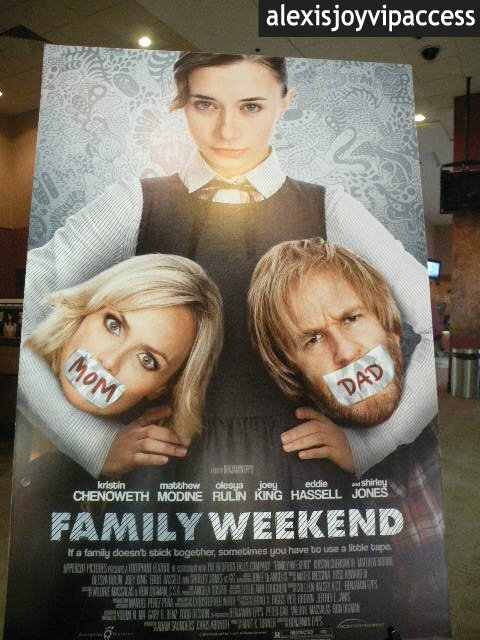 “Family Weekend” which comes out to theaters in limited release on March 29, 2013 is truly a movie the whole family will enjoy. “Family Weekend” brings together an all-star cast and crew who graces the big screen with such charm. The movie features the talent of Olesya Rulin (Emily Smith-Dungy), the consummate actress Kristin Chenoweth (Samantha Smith-Dungy), profound actor Matthew Modine (Duncan Dungy), Joey King (Lucinda Smith-Dungy), Eddie Hassell (Jackson Smith-Dungy), Robbie Tucker (Mickey Smith-Dungy), Shirley Jones (GG), Chloe Bridges (Kat), Chase Maser (Chris), and many more. The work of director Benjamin Epps, producers-Adam Saunders (who also starred in the movie as “Rick”) and Chris Aronoff, and writer- Matt K. Turner was terrific and made the movie so realistic and one in which families all over can relate to. Having covered and attended the “Family Weekend” NYC special screening on March 21, 2013; I can say that I enjoyed the movie from start to finish. Each cast member and crew did a spectacular job and each of their contributions to the film made it the wonderful film it is today. One of the most fantastic elements of the movie is the message of the film. “Family Weekend” helps families realize that the most important thing in life is family and the care, love, and support for one another. I very much recommend families all over to go and see “Family Weekend” in theaters. It’s a wonderful film with an all-star, excellent cast and crew that families will definitely appreciate! I have no doubt that “Family Weekend” will become another house-hold name.